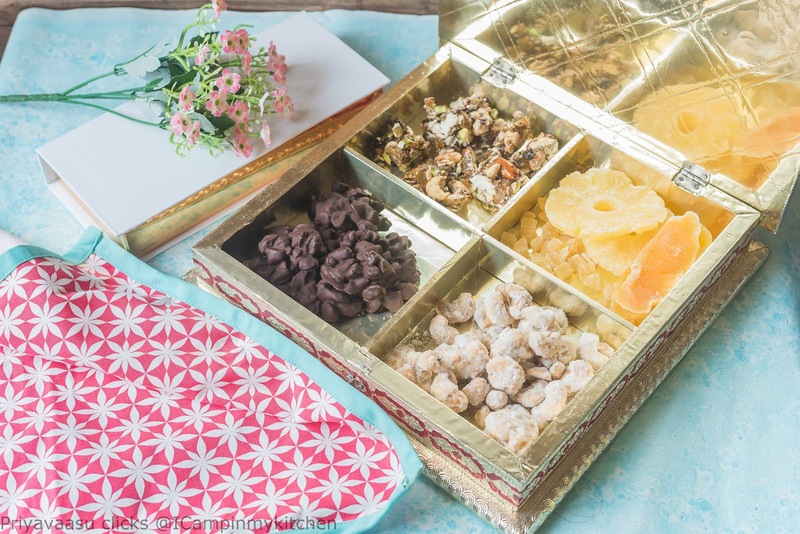 When i decided to make 3 different candies for this week Blogging marathon, i wanted to make something similar to the gozinaki, which i made in 2014 for one of our Mega BM. During that year i have made that candy many a times,taking them with me to all my friends parties and get togethers. It was such a hit. This time around, i wanted something that is chewy and the caramel getting stuck in your teeth kind of candy. This recipes nails that on that dot. My lil one was the first one to taste this and he loved that texture the pull the caramel gives when you bite a chunk of this nutty goodness. 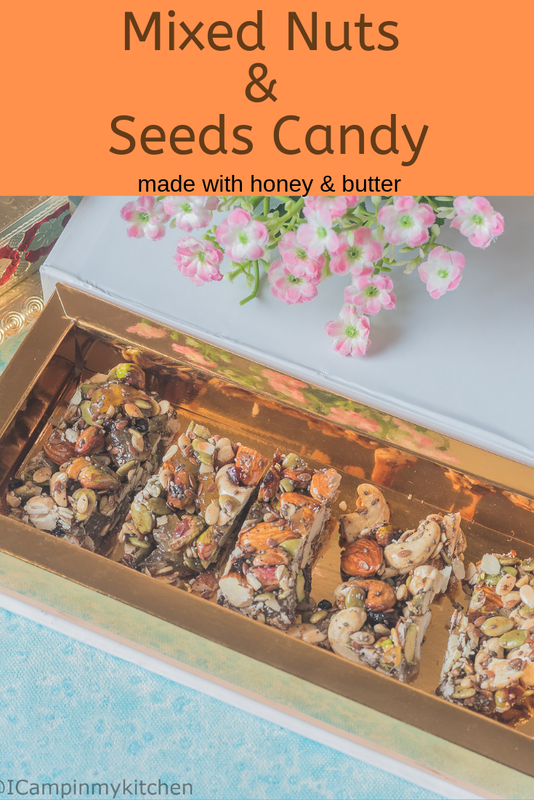 I have added all the nuts and seeds, i had in my pantry, tipped in some dried candies too, when my lil one can enjoy this, i bet any kid in the world would give this a try, he is such a tough master to please or cheat. These candies make a great edible gift for parties and festivals. Very healthy for kids and adults to snack on, they fill you up pretty easily, so go easy on the snacking part. Do try and let me know how you liked it. First get you nuts and seeds measured, chop them roughly. 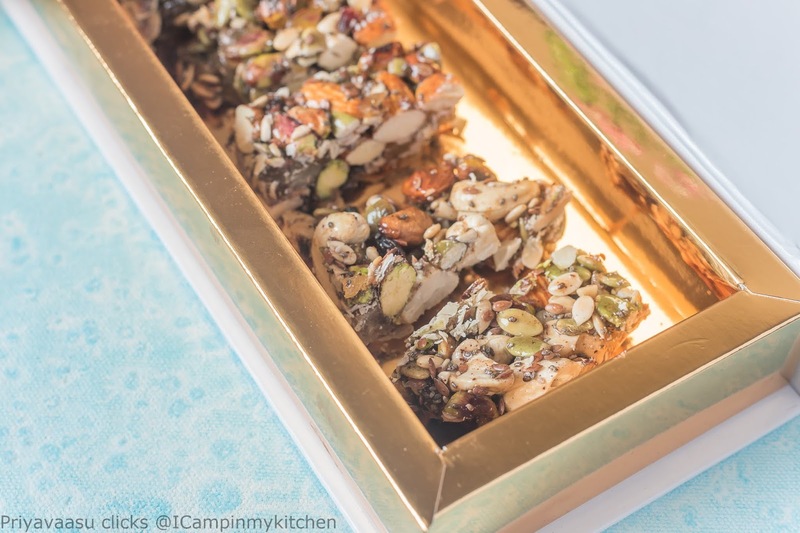 In an over-proof tray, tip in all the nuts, drizzle a tsp of oil on top and mix it with your hands. Preheat the oven to 180C and roast the nuts for 8-10 minutes. Temperature and timing vary from oven to oven, so keep an eye on the nuts from 8th minute. Once they are done, remove from the oven, let them cool completely before you use them in the recipe. To the roasted nuts, add chopped pineapple, chopped mango, candied ginger, chia seeds, raisins and cranberries. Mix them well. Keep a small tray greased with butter, to shape the nut candy. Heat a heavy bottom pan, that would fit all the nuts, add honey and butter, keeping the flame simmer. When the honey and butter melts, add the cinnamon and ginger powder to it and whisk well. When it starts to bubble, take it off the stove, add the nuts and seeds to it, and give it a brisk stir. 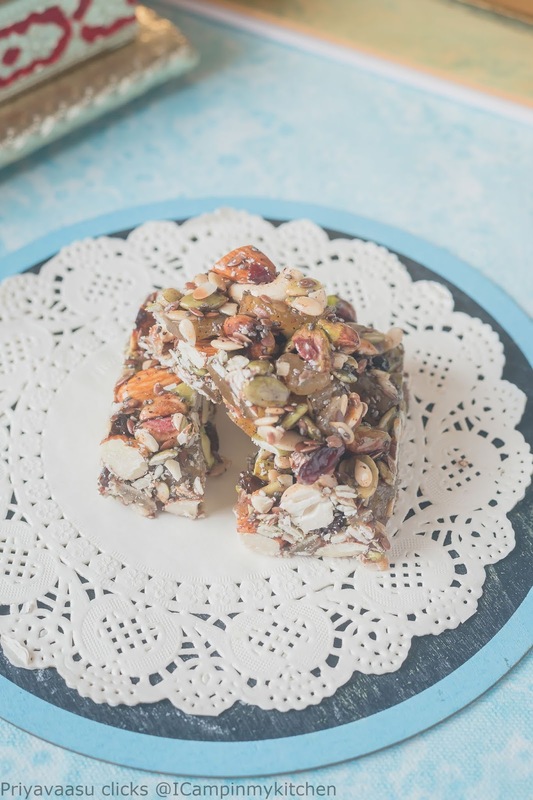 Pour this honey and nut mix to the buttered tray, smoothen the top with spatuala. Let this sit for 15-20 minutes to set. I actually left in the fridge for it to set fast, as i had to click pictures before the light fades off. After the said time, loosen the edges of the candy and invert it onto a chopping board and cut them into squares. Store it in an air-tight container. Mine got over the same day as both my kiddos loved it. Lovely share. Mixing variety of nuts and seeds, thus making it Wholesome as well tastier too. These candies look so colourful because of all the nuts and seeds. 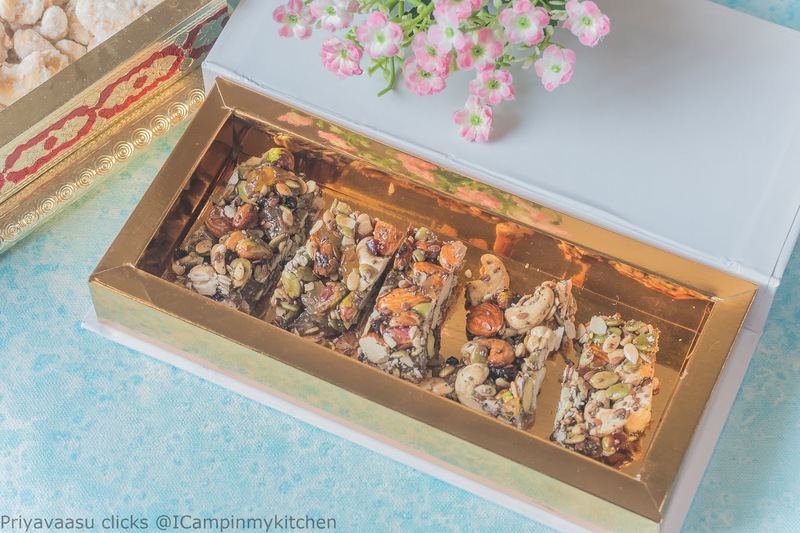 The sticky caramel and crisp nuts sounds so tempting. OMG! Looking at the ingredients list itself enough for my mouth to water. The pictures are a torture. Wow, love all the ingredients in one recipe. These looks healthy and delicious too. Lovely share. Wow, love all the ingredients in one recipe. These looks very healthy and delicious. Lovely share. Wow you are a candy master. Have done it so perfectly they look like store bought. Beautiful.